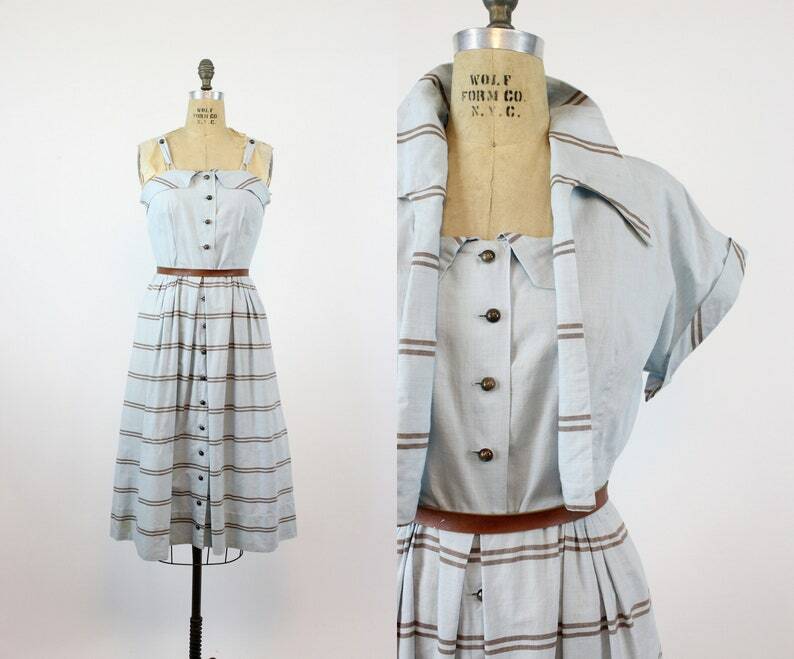 Breezy 1940's summer dress! Done in a cool cotton in a light shade of sky blue with horizontal brown stripes. The bodice of this dress has a straight neck line with a pointed collar that follows the whole of the bust. The straps attach to the bodice with a loop in the front. Bodice buttons down. The matching bolero coat has a large pointed collar and cuffed sleeves, no closure. Skirt has some gathered pleats in the front, is a fuller a-line silhouette. Snap at waist and buttons down. Dress and bolero are unlined. Condition: Very Good Vintage: one discoloration spot at the back middle of skirt, and one by hem, see second to last photo. Bust (underarm seam) : 36"